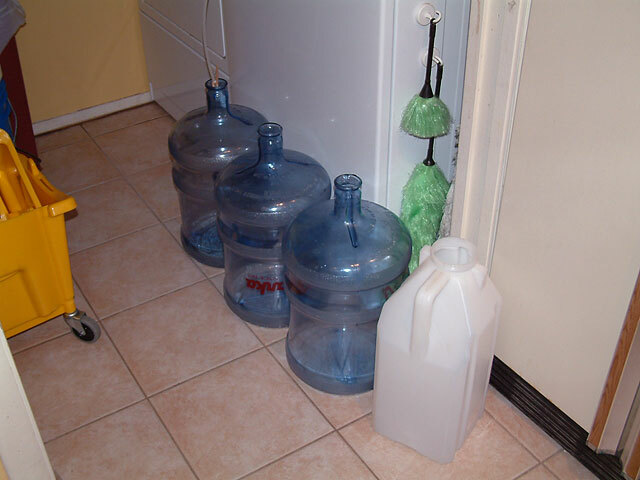 A few containers can be used to store freshwater, and keeping them sealed will prevent contamination. Freshwater - water that has no salt added. This is basically tap water. RO water - Reverse Osmosis purified water or filtered tap water. RO/DI water - Reverse Osmosis De-Ionized purified water or filtered tap water that has the most impurities removed. This is the type of water that is recommended for our tanks (after it's been mixed with salt). RO unit or RO/DI unit - a series of filters and membrane to filter tap water. Top-off – to replenish what has evaporated. Auto top-off - an automated system to care for top-off needs. While some prefer to top-off their systems manually every day, it is easy to become lackadaisical and slack off with this important duty. Others incorporate an automatic top-off system into their system, drawing RO/DI water from a nearby or remote reservoir. 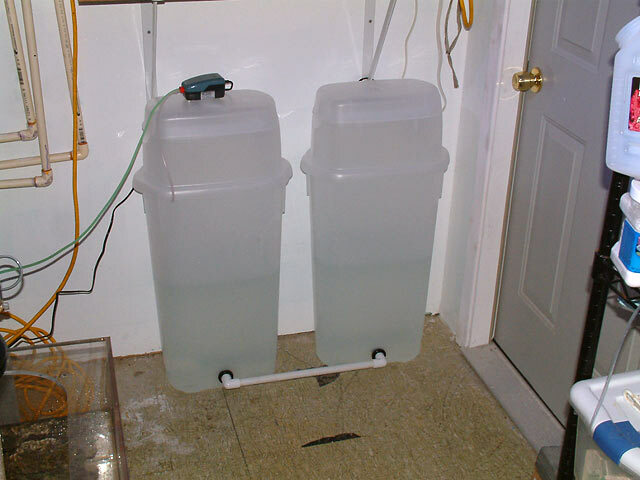 These two wallpaper containers were plumbed together with bulkheads and PVC to store a combined 20 gallons of RO/DI water. If the float switch fails, even two switches used in succession for redundancy, water will be continuously added to the tank until its owner notices. This will drop the tank’s salinity and kill the livestock, plus flood the floor. This just happened to a friend of mine who travels a lot. Two switches failed, and he lost his livestock that he'd had for over four years. 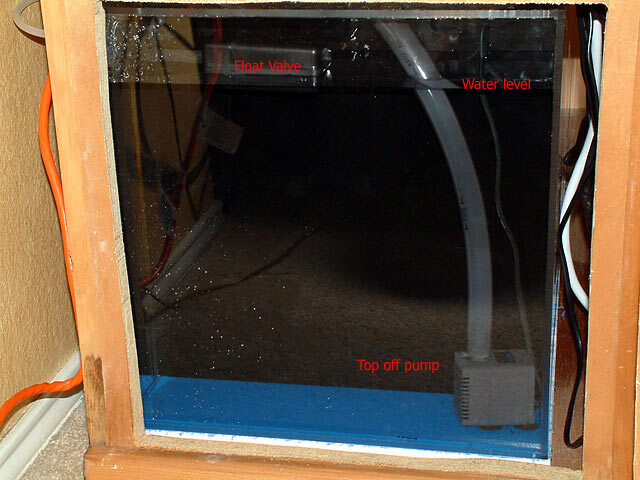 If the protein skimmer overflows, especially if it is external (located outside the sump), RO water will be added non-stop until the owner notices, and this results in the same issues mentioned above. If the aquarist has the RO unit connected to a Nielsen reactor, and the float switch fails or the protein skimmer goes nuts, RO water will be added to the reactor non-stop, which mixes with kalkwasser powder; thus the tank's pH will spike and kill all the livestock. Kalkwasser has a pH of 12, and our livestock lives in a range from 7.9 to 8.3. The city's water department came out to replace a resident's water meter. To do so the technician had to sweat in new copper fittings. That water went right through the RO unit, adding contaminated water directly into the sump. Copper levels rose in the tank, and all the invertebrates died. Yes, this actually happened; and over 30 cleaner shrimp and other crabs died in the reef tank. The city's work crew completed new plumbing construction for a new subdivision. When doing so they had to tie in the new development’s plumbing to the current residents’ existing plumbing. To make the water carried by that plumbing safe for human consumption, they poured pure ammonia through the lines, which backed up into the established residents' drinking water. Ammonia went right through an RO filter and wiped out a reef tank. This occurred twice (!!!) in the same 12-month period. That person now tests her water for ammonia every time she makes a batch of RO water. What a pain! Do I recommend testing for ammonia and copper every time you make water? No. But if something unique has occurred in your area, such as if someone has worked on your plumbing recently, or the city has worked on plumbing on your street, it is advisable to take the time to make sure all tests are normal. You might opt to routinely test your water on a monthly basis just to make sure it is phosphate, ammonia, nitrate and copper-free; especially if you have reason to believe something is (or might be) out of the acceptable range. What I do recommend is that hobbyists set up a reservoir with a fixed amount of water, and use that to top-off their tank for a few days (or a week) at a time. This reservoir should hold only enough water so that if all its contents were dumped into the sump, the sump would not overflow and the tank would be able to absorb that additional volume of freshwater without excessively dropping the tank’s salinity (RO/DI water) or raising its pH excessively (kalkwasser). In a nutshell, I don't recommend a fully automated system because something will go wrong if a hobbyist isn't attentive. We have the duty to inspect equipment to keep our livestock healthy and happy, and it takes only a minute or two each day to ensure that everything is operating correctly. My containers are running low, so I open the ball valve and let the RO/DI unit flow. Four hours later, the reservoir is full and the float valve stops any more water (hopefully) from entering it. I'm busy running an errand, buying new livestock or whatever... When I come home six hours later, I turn off the RO unit to avoid any more water being produced, and all is well for four days. Is there a risk? Yes! If, during that four hour period, the float switch fails in the sump, RO water would continuously be added until I noticed that my reservoir wasn't filling up normally. Murphy has a way of timing everything perfectly for disaster. This is the safest method I can think of, and ensures that the livestock live a long healthy life. My 9.5-year-old Percula clownfish thanks me daily for averting disaster by being very careful. When going out of town or on vacation, turn off the water going to the RO/DI unit. If something goes wrong, your home may be flooded, causing significant damage. One Thread of the Month winner (”My best hitchhiker is an octopus!”) suffered such a disaster and, to make matters worse, the broken fitting sprayed water into the nearby circuit breaker panel, which shorted out power to the owner's tank, killing all the livestock. When he returned, his tank had been powerless for days. Another hobbyist came home to a half-flooded house that took months to restore. If you have a tank sitter, show him how to turn on the RO/DI unit if additional water is needed. It might also be worth considering the purchase of a moisture sensor tied to a solenoid that detects when the floor is getting wet, to shut off the source water going into the RO/DI unit. In this way you can limit how much water floods your home in the event of a disaster. A fitting can break loose, a housing can crack or a float valve/switch can fail. Until someone notices the problem, water will continue to flow non-stop and cause serious damage. If you are going on vacation and don't use an auto top-off, determine how much water will evaporate from your tank for the number of days you’ll be away. 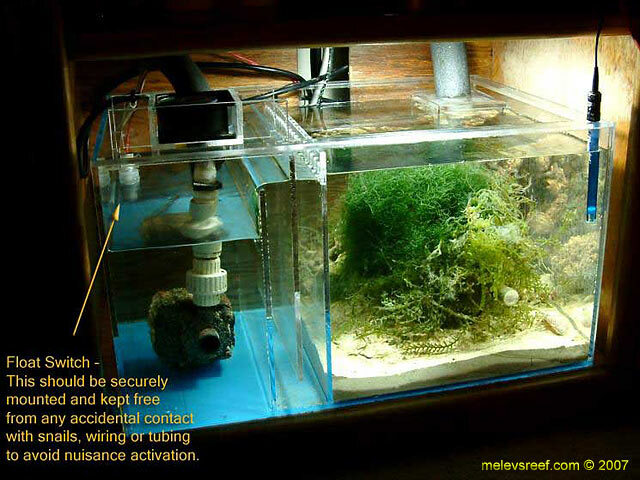 If your sump has the space to hold that additional volume, add it slowly over a day's time. Adding this much water may affect the tank’s salinity, as will all the evaporation during your absence, but this is undoubtedly preferable to returning home to a disaster. Using a dosing pump that matches the tank’s evaporation rate is another method many employ. Dosing pumps can be regulated with a controller or an electrical timer. When purchasing a dosing pump, get one that closely matches your system’s needs. If the tank evaporates three gallons per day, the dosing pump should pump 1-7 gallons per day, not 15-25 gallons per day. Oversizing the dosing pump is just another possible disaster that will strike when Murphy dictates. A plastic float valve tends to be safer than an electrical float switch because it can’t fail and/or leak electricity into the water. Plastic float valves (image two pictures down) are filled with air and float on the water's surface, rising and falling as the water level changes. Once the water level his risen to the set point, the valve seals off, stopping any additional flow into the system. Float valves need to be cleaned regularly (especially when dosing kalkwasser), but are quite reliable. Float switches (image below) operate with electricity, and for safety’s sake it is best to wire these to use low voltage in conjunction with a relay. When the float switch drops (due to evaporation), it triggers the relay to open the circuit and provide sufficient electricity to operate a powerhead or pump. Using a controller to measure the tank’s pH allows for a degree of safety. 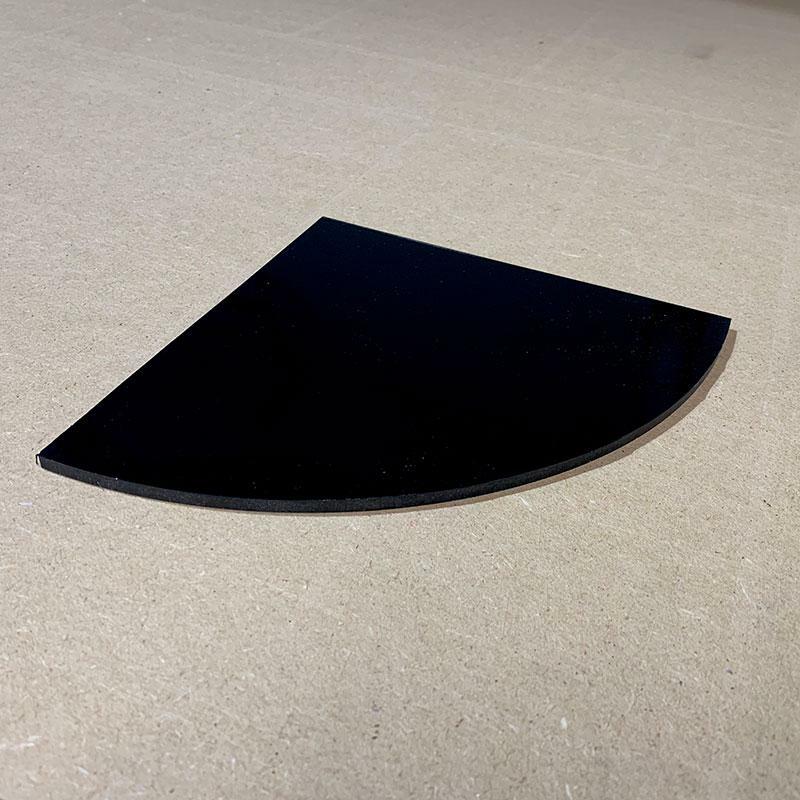 If the pH rises too high due to excess kalkwasser being added, the controller can turn off the protein skimmer, causing that water to pour back into the sump, raising the water level and disabling any further top-off. The controller can be set up to close a solenoid valve to prevent any more water from being added to the system. 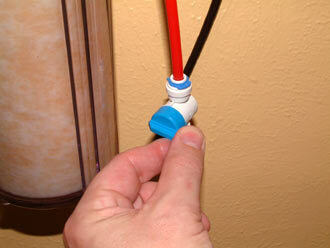 A garden hose timer can be set to run for a specific period to produce RO/DI water. The timer will shut off the flow to the RO/DI unit and no more water will be produced. If possible, it is best to drip kalkwasser independently of the top-off (RO/DI water). The steady drip rate using the gravity method should be fairly safe in that it will never be able to overdose your tank. Never believe that your system is immune to disaster. Even as you read this article, review your current setup and see if any changes are long overdue.